Antibiotics are powerful medicines used to treat certain illnesses. However, antibiotics do not cure everything, and taking them when you don’t need them can even be harmful. There are two main types of germs that cause most infections – viruses and bacteria. Antibiotics are only effective against bacterial infections and cannot kill viruses or help you feel better when your illness is caused by a virus. “Each time you take or give your child an antibiotic unnecessarily or improperly, you increase the chance of developing medicine-resistant bacteria – and that affects all of us,” says Brenda Martin, CRNP, with LVPG Family Medicine–Bath. Medicine resistance happens when bacteria develop ways to survive the use of medicines meant to kill or weaken them. Resistant bacteria do not respond to the antibiotics and continue to cause infection. This also means that if you are exposed to a resistant bacteria and develop an infection, that infection is harder to treat. Because of these resistant bacteria, some diseases that used to be easy to treat are now becoming much more difficult. That’s why it’s so important to take antibiotics only when you really need them and to take the entire course of medicine as prescribed. If you are prescribed an antibiotic, it’s important to take the medicine exactly as instructed – and that includes finishing the entire bottle. The care team at ExpressCARE can determine if an antibiotic or another treatment is your best course for recovery. 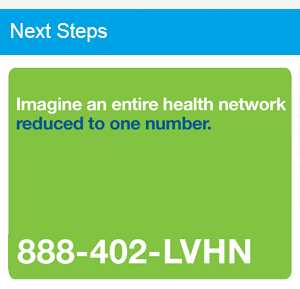 Visit LVHN.org/ExpressCARE to find a location near you. Visit LVHN.org or call 888-402-LVHN for more information or to schedule an appointment with a primary care provider.